The way that the 8’3 x 4′ Windsor Shiplap Pent Shed offers so much storage space, but at the same time does not require a large garden shows just how good Windsor are at designing practical, but great looking sheds. This is a very attractive shed with four large windows and a well crafted door making it a very inviting and friendly looking type of structure. 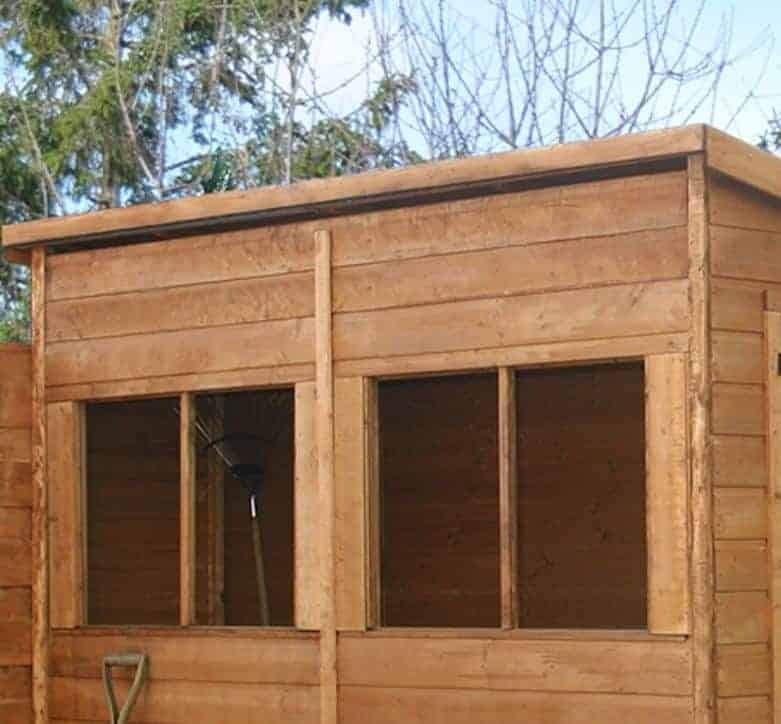 The walls have a very smooth look to them and in all this is a shed which is going to brighten up any garden that it goes into all the while offering you a very generous amount of storage space to keep gardening items, tools, clutter from the house or anything you want safe from the rain. The gorgeous tongue and groove shiplap cladding does more than just make this look good. It also makes the shed weatherproof and along with the felt covered pent roof will not allow any rain to get inside. The doors and windows of the shed can be placed in a location that suits your needs which just adds to the practicality of the structure. The high quality flooring of the shed will allow you to be able to put a lot of heavy items inside here without worrying about the floor. 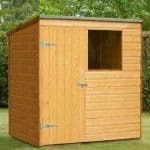 Windsor have cleverly chosen materials for this shed that manage to be very durable, but also very stylish. The 8’3 x 4′ Windsor Shiplap Pent Shed is the ideal way to give yourself some extra storage space in your garden if you are a bit short on actual space, but want something that can offer you a lot of storage room to make use of. We are very impressed with the design of this shed, from the pictures, you may think that this is a truly huge shed that requires a large garden. Thanks to the very clever design by Windsor though this is not the case. 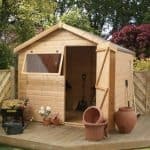 The shed does offer you an incredible 8 feet of depth which is where most of the space is, but to allow this to fit into any garden, Windsor have made the width of the shed 4 feet. 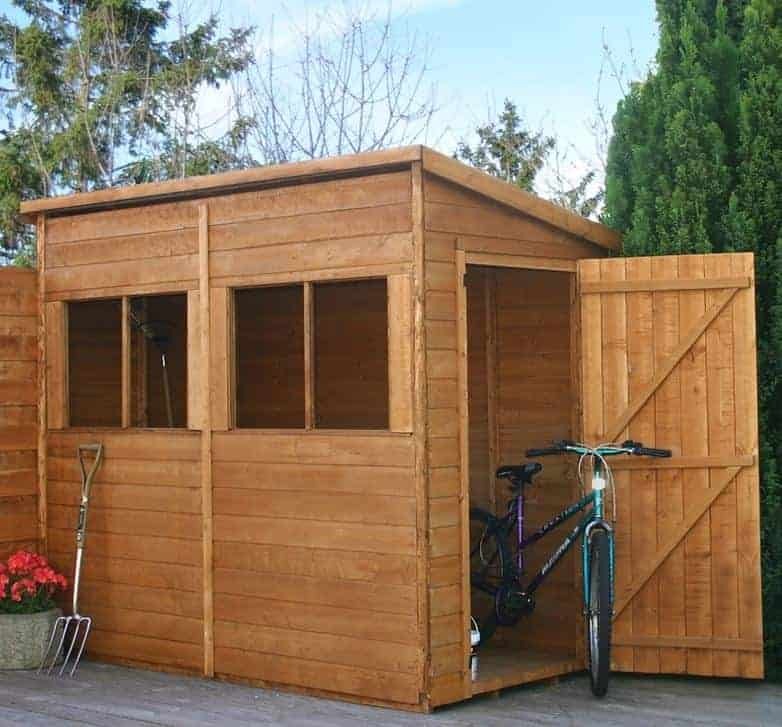 Now this this is a nice amount of space, but what makes this a shed ideal for any sized garden is how, you the customer get to decide exactly where you are going to put the door. So you can have it on the side or right on the front it all depends on the amount of space you have in your garden and where you want the shed to go. The height is something that we were very happy with as at the highest point right at the front there is 7 feet of headroom which then as it slants to the back of the shed is 6 feet 1 inch at its lowest point. Windsor love to use a pent roof and to be honest it is something we like to see. The pent roof they have used here makes it so the water will always run off the back of the shed. The roof is covered with some very high quality felt, but as the roof is so high, you probably will not really notice it as it happily does a good job in keeping out the rain. Underneath this felt we have some 10 mm thick solid sheet boarding which is strong enough to take the heaviest rainfall and many inches of snow. For the cladding, Windsor have gone with some very smooth looking, 12 mm thick tongue and groove shiplap cladding. We really do love how great this looks and it is impossible the first few times you are close to the shed to not want to just run your hand across it. 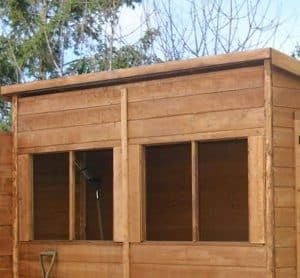 This type of cladding is amazing at protecting what you have inside the shed and it is a very stylish look means that it also makes for a very pleasant addition to your garden and that it will look lovely as it stands there offering you years of service. One thing that we love to see is a solid frame and when a shed looks as good as this one does on the outside we always hope that the bones holding it all together on the inside are going to be solid. Well solid they are as Windsor have gone and put in a 27 mm x 32 mm frame. A strong frame is essential for any shed that is going to last for lots of years. The frame here is so strong that if you have kids we are sure that even them messing around, kicking a ball off it, running into it and other such things are not going to affect the shed in any way. The floor is made with the same 10 mm solid sheet boarding that the pent roof is. This is a very strong floor and even if you have a lot of things stored in here and are walking around inside, you will find the floor stays firm. While the boarding is very solid what really gives this floor its strength is the fantastic floor joists which are underneath it. 27 mm x 32 mm floor joists have been used and they will ensure that the floor stays strong for many years. When delivered the shed will have a base coat of treatment, but as is the case with all wooden sheds the 8’3 x 4′ Windsor Shiplap Pent Shed is going to need a little TLC throughout its life. Do not worry this is not a huge amount of work and as long as you give it a coat of wood treatment shortly after construction and then once a year, the shed will last you for a very long time. 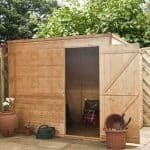 Windsor give you a ten year anti rot guarantee with their shed, but you must make sure you are treating the wood in order to make the most of it. Before we talk about the best feature of this door let’s take a look at the dimensions. This is a single door, but as you can see from the picture it does offer you a lot of room to get things in and out. The height of the door is 5 feet 4 inches and the width 2 feet 4 inches. What we love about this door is that when you are constructing the shed you can choose exactly where you want it. The door can go in a few places on the front or on either side this is something that we really love as it makes it so the shed can fit into almost any type of garden. The door is kept secure thanks to some heavy duty hinges and a pad bolt to keep it closed. The pictures show the windows on the front of the shed, but of course if you plan on having the door there then they will have to be moved to a different location. The windows are actually much easier to install than you would think and we love how just like the door they can be placed where is most convenient for you. The windows are made from some very durable, styrene to prevent them being able to be smashed and glass getting everywhere. This is a very good bonus if you have kids who will be playing with a ball in the garden. The 8’3 x 4′ Windsor Shiplap Pent Shed is a very secure structure and the pad bolt does a wonderful job in keeping the door closed even when it is very windy, but to make things more secure is not only easy it is also very cheap to do. A padlock can be fitted for very little cost to the pad bolt and will keep the shed very tightly locked up. To be honest those gorgeous windows do not really allow for much privacy, but adding some curtains or blinds would not be that much hassle and keep what you have inside hidden away. One thing that gives a wooden shed the edge over a plastic one is how easy it is to give it a bit more personality. You can get wood treatment in almost any type of colour these days so you can give the shed a bit of your own creative flair and also protect the wood at the same time. Windsor do not provide a padlock so you will have to buy that if you want to add to the security of the shed, but that along with the wood treatment is all you will have to purchase. The high quality of this shed is very impressive. It is even more impressive when you consider it is coming in at under £500. We feel that with the right amount of care that this shed will last you for many years. The materials that have been chosen are very high quality so they will be standing strong for a very long time. We know that some may be put off by the 4 feet of width, but trust us when we say the 8 feet of depth more than makes up for it. Plus if you plan out the way you are going to store things then you can really get a lot of things inside here. This is not the hardest DIY job in the world and thanks to the easy to follow instructions it should not have you and your friend who is helping arguing. The only issue you may have is coming to a decision on where you want the doors and windows to go. 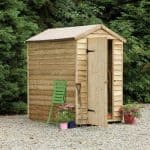 At, £479.99 we do feel that this shed offers style and plenty of storage for a very reasonable price. Final Thoughts: The 8'3 x 4' Windsor Shiplap Pent Shed is one of the most cleverly designed sheds we have seen in a long time. 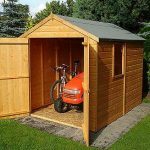 By putting most of the storage space in the depth and by allowing you to place the door and the windows where you want, Windsor have ensured that this is a shed which will be able to easily fit in any style or size of garden. 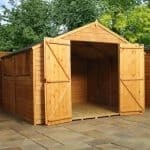 The storage space, the fantastic materials which have been used and of course the great price make this a shed which is very easy for us to recommend, especially if you do not have a huge garden.